At PrintDesigns, you could say that we are something of an expert in our field – we have been designing, producing and printing a wide range of marketing materials for exhibition stands and other trade purposes since 1999. In the space of those 10 years, much has changed in the industry in which we know so well as technologies have evolved, trends have developed and best practices have come in and out of favour. Where once the humble ‘twist, pull and click’ paper roller banner was the holy grail of tools for producing a great exhibition stand at a trade show, we now stock a new system which we feel is the next step forward in promotional products – even the BBC agrees with us! 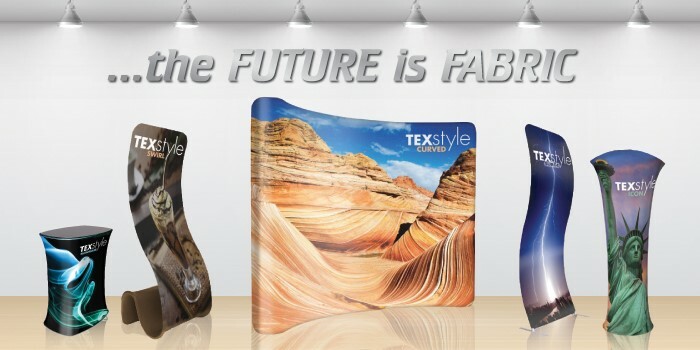 TEXStyle fabric display stands are a curvaceous, contemporary, lightweight look into the future of printed display stands – these incredible pieces of kit can be found at other print companies, but at PrintDesigns we are one of the few UK suppliers to keep all production of TEXStyle graphics in house, printing and sewing the whole display stand at our very own workshop. Are you wondering why we are so excited about these TEXStyle banners? Better to transport: Conventional roller banners are loved for their portability, but compared to the TEXStyle fabric displays they seem awkward and cumbersome! These new era of banner stands are less than a third of the weight of their traditional counterparts and a third of the volume, making them easy to bring across the world with you as you hop from trade show to trade show. Simple to assemble: There can be all sorts of complicated things to remember at a trade show, ranging from logistics all the way through to sales strategy. The last thing you need is a hard to assemble banner stand taking up valuable time and brainpower! With a TEXStyle stand, a one piece printed fabric graphic is simply slipped over a lightweight frame which is quickly built thanks to the sticker guides to follow. With these banners, more time can be spent on the things that matter the most when attending an exhibition. ‘Fresher’ for longer: No matter how thick the paper is on a conventional pop-up display, over time they can be easily marked, ripped, creased or folded, reducing the impact of your banner stand. The one-piece printed fabric graphic of a TEXStyle display can be machine washed after every use, renewing your exhibition stand for a professional look every time. 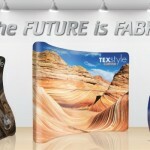 Do you want to discover for yourself how great this new era of display stands are? Get in touch today!